The Zone is not some mystical place, but a real physiological state defined by very specific blood tests. Inside the Zone, you have maximum control of diet-induced inflammation and every stage of your life becomes easier to manage. How Do You Get to the Zone? The answer is the Zone Nutrition Program. This is a highly defined dietary system that is clinically proven to get you to the Zone as long as you follow it correctly by treating your diet like a drug to be taken at the right dose and the right time. 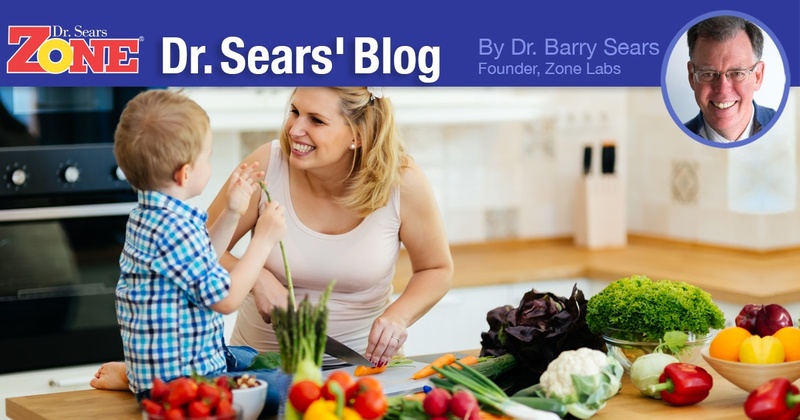 There are three distinct dietary components of the Zone Nutrition Program needed for optimal wellness. Any one of these components is useful, but when all are combined you have a powerful dietary “drug”. Calorie restriction, the foundation of the Zone Diet, is the only proven technology to extend life. Why? The more calories you eat, the more inflammation you create, as you have to metabolize those incoming calories to energy or storage. Regardless of what you hear, calorie restriction is also the only way to lose excess body fat and to prevent lost body fat from returning. You can only restrict calories without hunger or fatigue by balancing your hormones in the blood, brain and the gut. The Zone Diet helps you accomplish this by balancing your plate at each and every meal with a defined amount of protein, carbohydrate and fat. Your lack of hunger for the next five hours after a Zone meal is your indication of success. You have to consume adequate levels of omega-3 fatty acids to resolve existing inflammation. The blood will tell you how much. In particular, the AA/EPA ratio will give you precise information about the amount of omega-3 fatty acids you need. For the vast majority of people, that can only be done by supplementation. The primary source of inflammation for many comes from the microbes in the gut. Polyphenols can be considered the gardeners of the gut as they promote the growth of good microbes, while simultaneously acting as your first line of defense to the invasion by bad microbes. Again for the vast majority of people, getting adequate levels of polyphenols can usually only be done by supplementation. How Much Do You Want to Achieve Your Goals at Each Stage of Life? 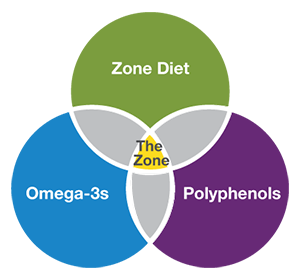 You need all three components of the Zone Nutrition Program working together to promote optimal wellness. Any one component is good, but all three working as a team allows you to achieve your goals at every stage of life. That’s what I call Zone Living.